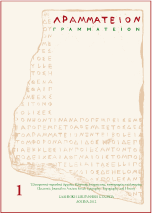 ΓΡΑΜΜΑΤΕΙΟΝ publishes articles on Ancient Greek Epigraphy, Topography and History in the following languages: Modern Greek, English, French, German and Italian. Submitted articles must reflect original scholarly work pursued by the author and not work that has been published elsewhere. Papers must be submitted electronically by email to ΓΡΑΜΜΑΤΕΙΟΝ in UNICODE font. Pictures and maps included in the papers are to be emailed in jpg or tif format. Pictures must be accompanied by captions. Authors are strongly encouraged to include also summaries of their papers, preferably in English. KEY WORDS. Each author is encouraged to suggest key words so that their article can be searched in the internet. BIBLIOGRAPHICAL REFERENCES. Non standard abbreviations used by the author should be listed at the beginning or the end of the submitted article. J. S. Traill, The Political Organization of Attica, Hesperia Suppl. 14 (1975) 35-55. M. J. Osborne, Philinos and the Athenian Archons of the 250s B.C., in Pernill Flensted-Jensen, T. H. Nielsen, L. Rubinstein (eds. ), Polis and Politics. Studies in Ancient Greek History. Presented to Mogens Herman Hansen on his Sixtieth Birthday, August 20, 2000, Copenhangen 2000, 507-520. Diane Harris, The Treasures of the Parthenon and Erechtheion, Oxford 1995. I. Travlos, Πολεοδομικὴ ἐξέλιξις τῶν Ἀθηνῶν, Athens 1960. [English]. I. Travlos, Πολεοδομικὴ ἐξέλιξις τῶν Ἀθηνῶν, Athènes 1960. [French]. Numbers of the volumes of the Journals and the Journals’ supplements must be written in Arabic numerals, for example: Hesperia 53, SEG 25, 178. ABBREVIATIONS:: Abbreviations of international Journals should conform to those of the Archäologische Bibliographie or the Année Philologique. Abbreviations of reference books or series, for example IG, SEG, LGPN (A Lexicon of Greek Personal Names, Oxford 1987-), Jeffery, LSAG (Lillian H. Jeffery, The Local Scripts of Archaic Greece, Oxford 1961), must be written in italic. References to ancient authors and works should be written according to the conventions of the Oxford Classical Dictionary, for example: Ar. Nub. 530, Plut. Vit. Demetr. 11.4, Thuc. 8,24.4. References to the inscriptions are given in the following way: ΙG I³ 68.12-14.